Kate bought the Winter Silk Vest Top in iceberg blue. 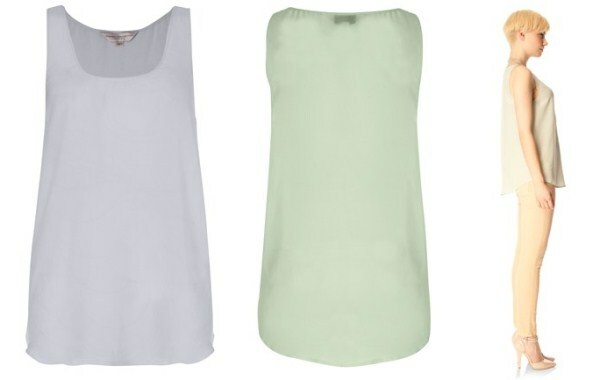 The top is currently on sale and available in a variety of colours from £27 to £49. Kate also reportedly bought the Tiffany Jeans in vintage wash (With many thanks to Ashley). The low rise, skinny fit jeans are $108. They have stitch detailing on the back pockets and have a faded wash. I think the jeans and top with a pair of ballet flats would look amazing on Kate, perfect casual look. Kate's protection officer was seen carrying an armful of bags from luxury British brand Jaeger. We mentioned the brand before as they designed the new uniforms for staff at Kensington Palace. 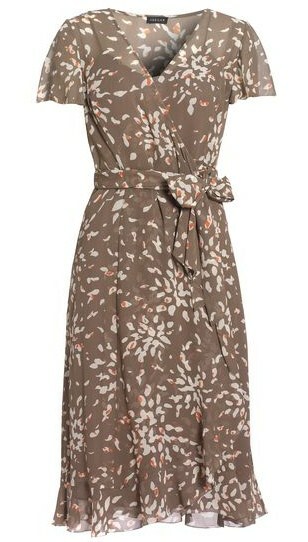 Kate reportedly bought the Silk Printed Wrap Dress for £240. The elegant dress would be ideal for the upcoming garden party at Buckingham Palace, or perhaps Kate will save it for the tour? Finally Kate popped into Anthropologie where she spent time browsing. Kate contemplated purchasing the £158 Ines Column Dress and the Luscious Langoustine Dinner Plate (not exactly the type of tableware one would see at Kensington but perhaps a fun item for a small dinner party at Anglesey :)) However Kate left empty handed. Possible future purchases in my opinion. We all know the Royal family are notoriously private but Katie Couric has managed to get a rare interview with Prince William and Prince Harry as part of the lead up to the Queen's Diamond Jubilee. In the preview William jokingly remarks: 'As I learned from growing up, you don't mess with your grandmother'. The interview also features an exclusive tour of Buckingham Palace. It airs on ABC, May 29th. You can watch the preview here. This weeks issue of Hello! Magazine is packed with Kate news and photos. Love the cover photo. I have updated the 'Kate's Upcoming Dates' section on the sidebar, with a nice selection of events coming up. I'll be doing a post in more detail on them shortly. Thank you for the updates. The Jaeger dress is pretty. You do such a great job on updates about Kate. Oh I am so excited to watch the interview with Prince William. He is to talked about the Queen and about his wedding. But I bet he does not talk about his beautiful Duchess. We know how protective he is of her. And I wonder if the Duchess was at the palace when the interview was going on. Will you guys in the UK get the interview? I'd imagine the interview will be posted on youtube for everyone to see. I just adore your updates! The U.S. media just doesn't detail us nearly enough. Thank you! OMG-I am SO SO SO excited you posted the first year special-I'll be watching that right after dinner tonight!!! And I cannot wait until the Katie Couric interview! Your blog is the best following Kate!! We don't have many news about the duchess in Spain.... You are doing a very good jod! 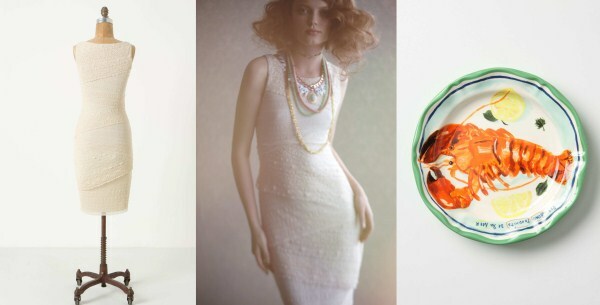 Love the Anthropologie dress. I wonder if she didn't buy it because i's very body conscious, and I doubt she could get Anthropologie to customise it. I wonder if she got to try on the Cullinan diamond jewellery before it went on display. I drool at the very thought! oh charlotte, thank you so much for showing the links to the ITV documentary! finally I can watch it too!! I just read that on Friday all of royals from the other countries attending the luch will be wearing all their jewels that includes tiars. So we can only hope that the beautiful Duchess will be decked out in jewels and a tiar. I can't wait to see what dress she will be wearing and we all know she will be the one that everyone whats to talk to. But the duchess does not want to take anything away from the Queen. So will she wear a long gownor a short dress? And we know the Duchess' Prince will look outstanding in what he wears, maybe a uniform? Charlotte Thank YOu so much for posting the 4 part series on their first year! :)) Cant wait for May 29th ABC documentary!!! Pauline I actually cannot find that tumblr but this one is great and is run by a lovely girl called Jasmine. Tomorrow will be very exciting, I'm expecting Kate will wear a knee length dress, no tiara I think, it's going to be momentous! Thank you for the website, I will check it out. Do you know if there is a time tomorrow for the lunch? I can't wait to see what the beautiful Duchess wears. I was hoping for the tiara but if you think not then we all will be disappointed. Do you think Camilla will where one? I hope not if the Duchess will not. No matter what the Duchess wears, she will rock it tomorrow. It's an awesome piece of writing in support of all the online people; they will obtain benefit from it I am sure. course credit you as the source. Appreciate it.